LISTENING IN THE CITY. SOUNDCITIES SOUNDMAPS. SOUND ECOLOGIES: LISTENING IN THE CITY. Stanza is presenting some new ideas and works….about sounds in the city. A day of presentations, participatory workshops and informal performance around themes of urban sound, networked sound, locative media and acoustic ecology – the relationship between living beings their environment, as mediated by sound. Here are my sensors all over London collecting data….onto google maps. This is the data I use to make sonicity. Listening to the city with sensors. This interactive website called soundcities.com allows the audience as creative user the possibility to remix the hundreds of samples recorded from around the world and then save their own mix. Soundcities is an online database of the thousands of sounds from around the world. The website also has series on online mixing desks where you can mix these sounds. 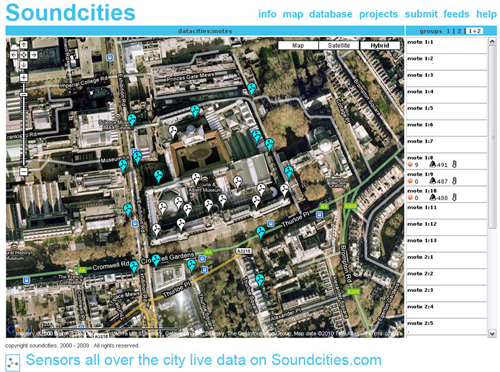 Soundcities uses city recorded soundscapes from world cities made over the last five years. All the sounds are now online also online as open source sounds. The database allows full open sourced access and listening to the individual sounds. The Database is also open so anyone can upload sounds they collect from world cities, thereby making a contribution to the project and making an online sounds archive. Soundcities is the worlds first online soundmap project. Next Entry: Stanza presents Robots at Nesta. Next Entry Stanza presents Robots at Nesta.